He rode on a donkey crowned as king. He knew what action this would bring. 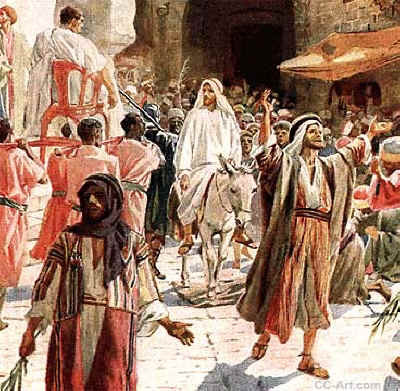 With Palms at his feet, Hosanna they cried. All hope for his safety now suddenly died. They traveled near and far to hear this holy man speak. He gave a message for those who did earnestly seek. The Scribes tried in vain to trap him then and there. The bulk of the multitude didn’t really care. God’s anointed calmly stood his ground. Those who understood; the great truths were to be found. The religious leaders left to orchestrate his demise. They banded together and formulated their cowardly lies. In the next few days Christ would suffer and be betrayed. The greatest human drama was now to be played. He died, he arose and transcended time and space. All those who believed spoke with him face to face.